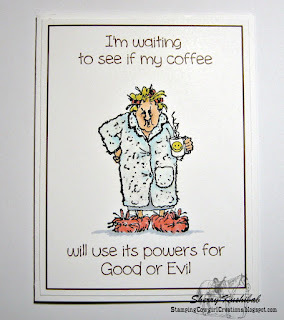 When you are checking out cards posted by people on FB and other places and come across a blog hop with the name Coffee Loving Cardmakers - how can you not immediately go and check them out.....and once you check them out you just have to make a card to join in the fun. From the looks of Maude one can only hope her coffee kicks in so you can stay on her good side all day. Maude is easy and quite fun to color, I inked her up to have a few extras on hand....I'm really fond of the darker robe and yellow slippers on one of the others, she has lots of options when it comes to robe and slipper colors. This background for this card was created on my Silhouette Cameo the image is Art Impressions "Golden Oldie Maude" - I can so relate to Maude most mornings before my coffee. She is colored with Copic markers and then layered onto a card background. 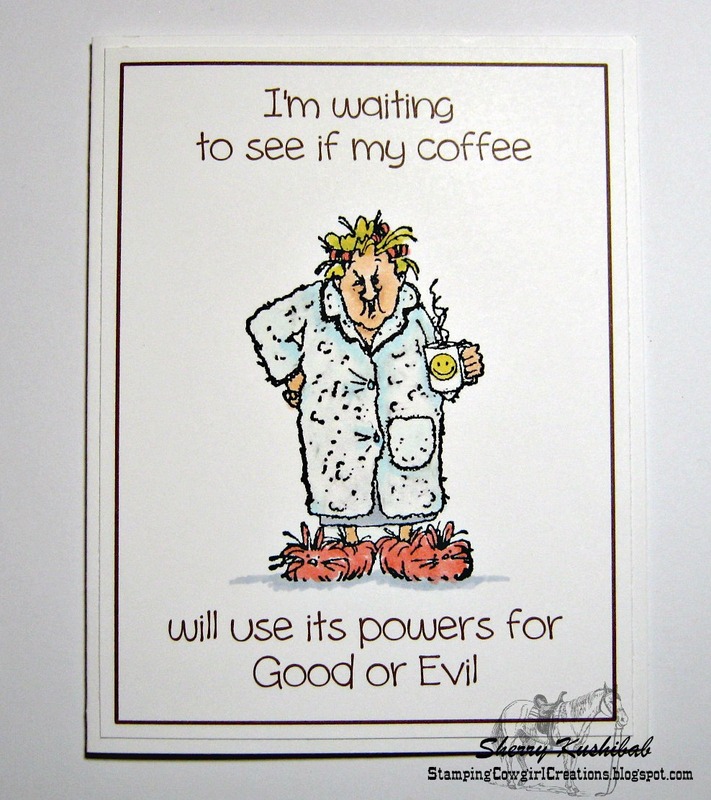 A pretty easy card with an image that made me giggle as I colored her.....Maude may have to go on a few more cards - I'm thinking her next sentiment will be "A Coffee A Day Keeps the Grumpy Away"...although looking at her that is rather hard to believe. Oohh. I forgot about this stamp - one of my favorites! So funny! Always a cute one to use. Hilarious!!! Great card for a friend! Made me smile, darn cute! Haha! Too funny! Great card! LOL...I love that sentiment. Such a fun card! This is simply fantastic in every way! Hahaha Such a funny card!!! Hilarious! Great card and love how you colored it.